Ambaguio is named after the Kalanguya term ‘Ambangiw’ which simply means a Moss but this town offers to local and foreign tourists more than a name. But aside from its vast agricultural lands, carved into mini rice, rootcrop and veggie terraces, it is also a home to other eco-tourism wonders and attractions. The number of mountaineers using the trail in the upland Ambaguio town, for one, has grown in the last three to five years, the local tourism office here bared. The Provincial Tourism Office (PTO), in the 3rd and 4th quarters of last year recorded less than a hundred mountaineers that opted to pass through the Ambaguio trail. Marichelle Costales, provincial tourism officer, said another 25 mountaineers were recorded in the first quarter of last year. She said Mt. Pulag can be reached via the Ambaguio Trail with the aid of tourist guides who will soon be properly trained by the Department of Tourism (DOT). Mt. Pulag, the highest peak in Northern Luzon, can be accessed through the main road in Benguet province or through the highway of Ambaguio town. The Ambaguio Trail consists of a path from Ammoweg-Upper Napo-Balete,Kayapa - Babadak, Benguet before reaching the Ranger Station. “Our trail in Ambaguio town is also being used by a growing number of mountaineers because it is more challenging. It has become a popular trail in the last five years,” Costales said. Project proposals and further recommendations to improve the Ambaguio trail and the establishment of other facilities for local and foreign tourists are now being studied for funding through the convergence program between the Department of Tourism (DOT) and the Department of Public Works and Highways (DPWH), she said. “Recently, a meeting to discuss these proposals was conducted through Rep. Carlos Padilla, along with DOT, DPWH and some provincial government officials,” Costales said. Aside from the trail, Ambaguio town’s eco-tourism potentials also offer sports tourism like rapelling and rope course at the Nabubungan Cave and Gulon Peak, rock climbing, water rafting and water tubing through the Matuno river and its tributaries, sightseeing and hiking along the Japanese trail, mountaineering at Mt. Pullol, touted as the highest peak in Ambaguio town, and agri-exposition of its upland agricultural products such as camote, upland rice and coffee. Other opportunities that await local and foreign tourists are nature tourism and complimentary tourism attractions and activities such as its traditional massage practices, biking, bird watching and nature photography. Farm tourism which promotes the agri-industrial and culture-tourism potentials of Ambaguio town is most appreciated through the holding of their yearly ‘Baykat’ Festival. The ‘Baykat’ Festival in celebration of the town fiesta also showcases the cultural and traditional practices of the Kalanguya tribe which is the town’s dominant indigenous group through its songs, rituals, dances and agricultural practices, among others. Held annually on June 17-19, the ‘Baykat’ Festival is now listed in the DOT’s list of festivals of the country. 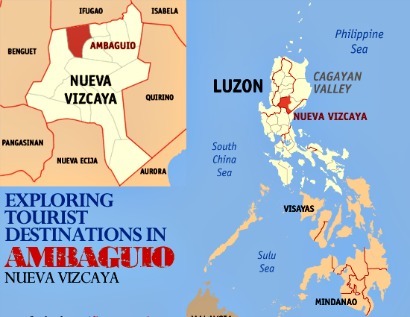 “From these potential and upcoming activities in Ambaguio, the town will probably be the next tourist attraction and another tourism pride of Nueva Vizcaya,” Costales said. Ambaguio Mayor Arnold Dinungon also expressed optimism on the national and local government efforts towards improving the access road from Bayombong town to Ambaguio. He said the gradual improvement of their main road will further uplift their economic status as an agriculture and eco-tourism municipality in the years to come.